Step 1: Measure the neckband. Step 2: Cut out a strip of the same or contrasting fabric as long as the neckband plus a little more. Mine measured 29 1/2" and was cut with a few inches to spare for good measure. The strip should be cut perpendicular to the selvage. It should also be cut about twice as wide as you want the neckband to be, plus 1 more inch for selvages. Step 3: Folding the neckband in half with wrong sides together, pin it along the right side of the neckband, matching raw edges. Baste in place. Step 4: Finish the raw edge using a serger or other non-bulky technique. Step 5 (optional): Topstitch along the garment to hold the serged edge to the wrong side of the garment. 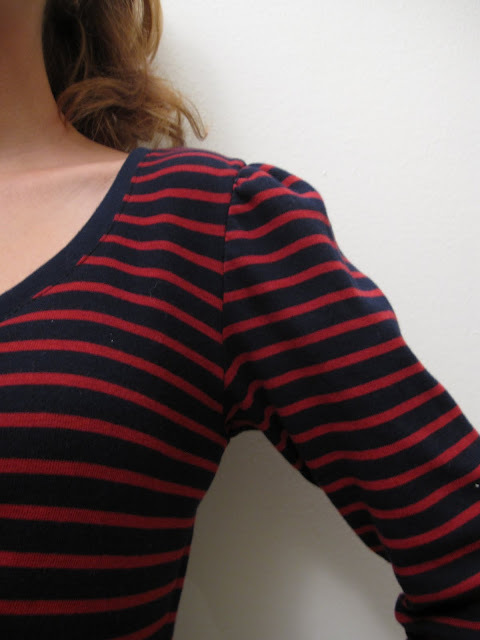 This will help to hold the collar upright and keep it from folding in. And here's the final view of the collar and capped sleeve. Not bad for a new technique. Check out the tutorial at Burda Syle.